Find information of all hot and happening events in Bangalore. We have the updated list of upcoming events happening in Bangalore like Music concerts events, Theater play, Food dining and business events. 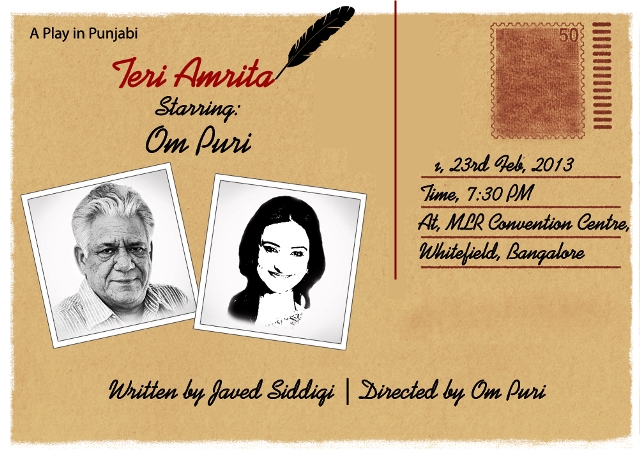 The play is a love story told through letters exchanged between the two protagonists, Zulfikar Haider and Amrita Nigam, over 35 years. 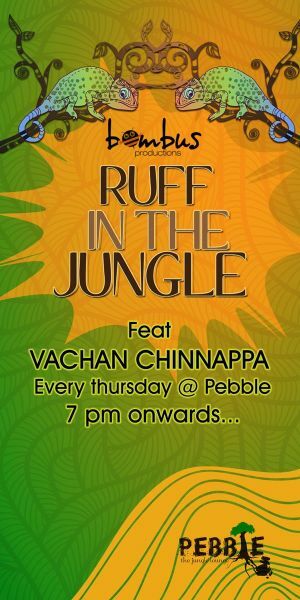 Ruff In The Jungle Live at Pebble on 21 Feb 2013 at Pebble – The Jungle Lounge, 07:00 PM. Come experience Drum n Bass. The only Regular Drum n Bass night in the Country. Drum and bass (/’dr?m ?nd ‘be?s/) (also written as drum ‘n’ bass and commonly abbreviated to D&B, D+B or DnB) is a type of electronic music which emerged in the mid 1990s. Kross Kulture nights at RAIN are created to appeal to the desirable intelligent clubber, conceived to promote humanities and arts in the variety of music,photography, visual & performing arts in real and digital medium. MoonArra world fusion band, an amalgam of Indian Classical, Jazz and World fusion music streams, having performed at some of the biggest and significant International festivals such as the Asiabeat Anthology Launch 2012, Delhi Jazz Festival 2012, Java Jazz Festival 2009 Indonesia, Bangkok Jazz festival 2010 Thailand, Little India inaugural in Kuala Lumpur Malaysia in 2010, local festivals in India like the Fireflies Festival, MadFest Ooty, Bengaluru Habba, Fete de La Musique, is all set to pay a unique tribute to legendary performers and artists who passed away in 2011/2012. 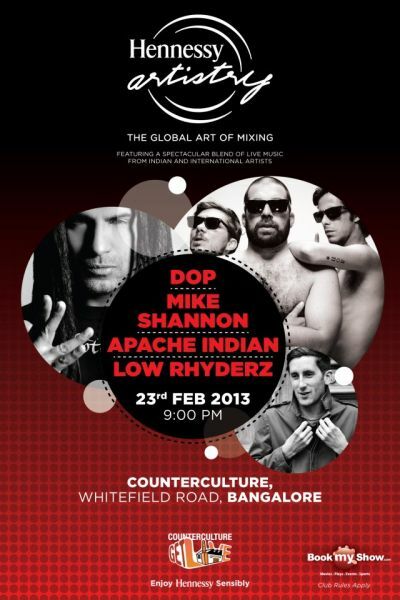 The Global Art Of Mixing @ Hennessy artistry. 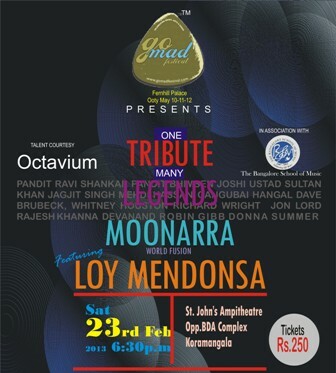 A Spectacular Blend Of Live Music From Indian And International Artists. Ananya and M.A. 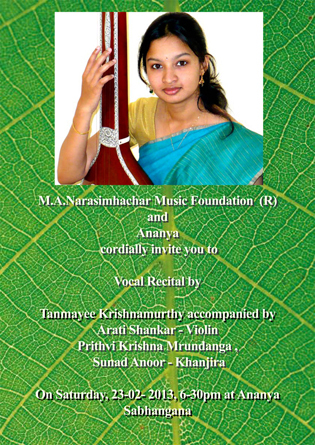 Narasimhachar Music Foundation cordially Invite you to Vocal Recital by Tanmayee Krishnamurthy. 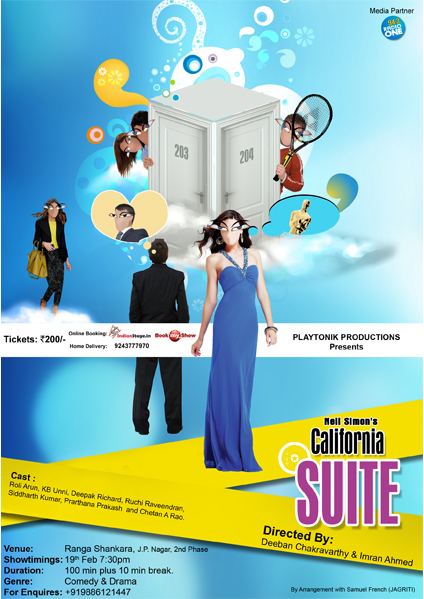 California Suite ( English Play) – Playtonik Productions on 19 Feb 2013 at Ranga Shankara from 7:30 pm. California Suite (Play) – Playtonik Productions Tired after a hard day at work! Want to relax! Look no where Playtonik Productions Presents Neil Simon’s ‘California Suite’ What happens when four different stories come together in one single suite! The Bangalore Queer Film Festival (BQFF) enters its fifth year. BQFF is an annual event that brings to its audiences queer films from the world over, photo exhibitions, performances and panel discussions. Over the years, BQFF has become an entrenched part of the cultural landscape of Bangalore. Just Theatre presents Somewhat Like a Balloon, a devised performance. 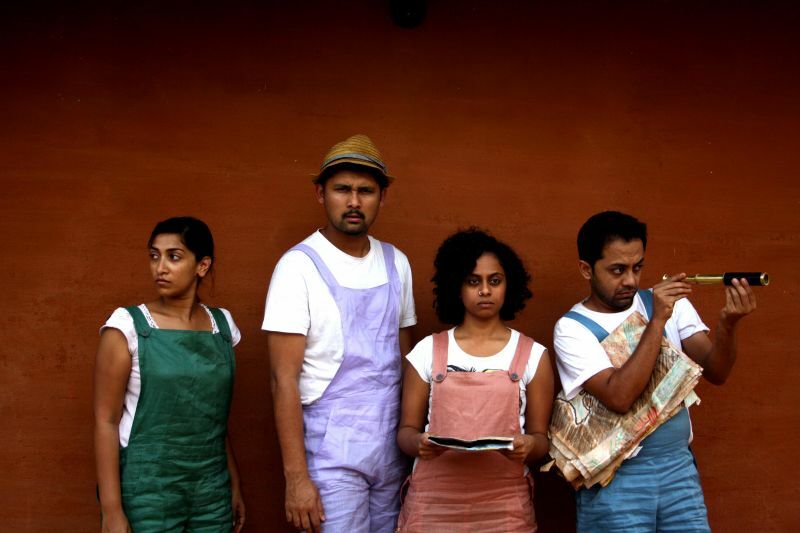 From the Bangalore-based theatre and arts collective that brought you Five Grains of Sugar and Park. 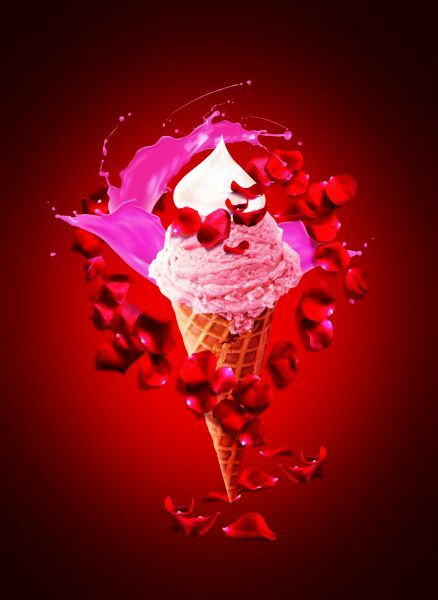 Dazzling Dreamy Date – Flavour of the month at Gelato Italiano from 1 Feb to 28 Feb 2013. For the month of February, Gelato Italiano introduces Dazzling Dreamy Date. Priced at an inviting Rs. 12, on 1st February, it can also be had for Rs. 18 in a cone on 1st February. In this month of romance, indulge in the seductive combination of crema and nutty pistachio. Enjoy the advent of spring at our alfresco bar with live grills. Seasons fresh produce, meat, seafood and fish grilled to perfection. served with global marinades ranging from Oriental Teriyaki, Mediterranean Harissa to North African Chermoula. Presenting a modern twist to the traditional bento box, Like That Only, the Asian-inspired bar and restaurant in Whitefield Bangalore, introduces ‘Out-Of-The-Box Bento Lunch’ – a fun, quirky and surprisingly quick lunch service – offered on weekdays (Mon- Sat) from noon to 4pm. 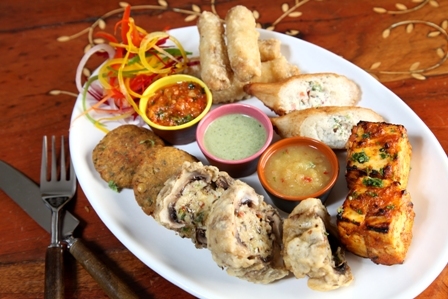 Loose your self in the flavours of Punjab! – Satiate your taste buds with some delicious kebabs. 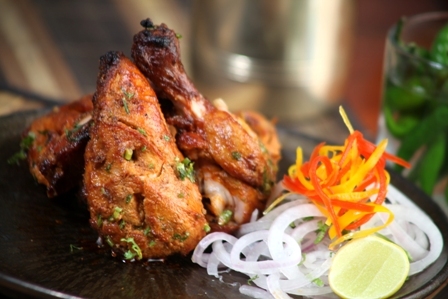 Treat yourself to some delectable and scrumptious kebabs this New Year at Pind Balluchi’s Kebab Festival! 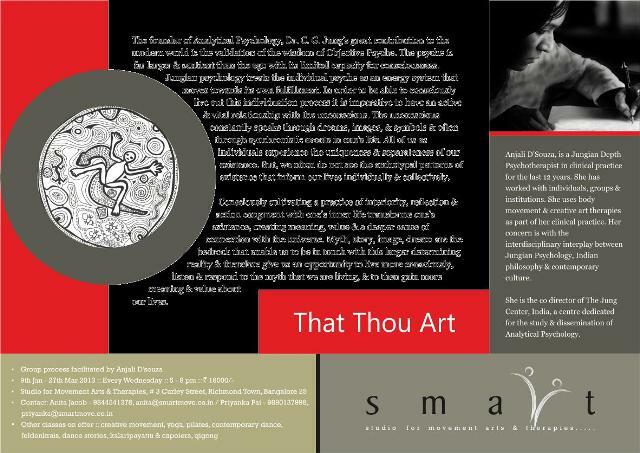 Group Process Workshop – That Thou Art at SMART from 9 Jan to 9 March 2013. The founder of Analytical Psychology, Dr. C. G. Jung’s, great contribution to the modern world is the validation of the wisdom of Objective Psyche. The psyche is far larger and sentient than the ego with its limited capacity for consciousness. The event shall be a remarkable and unprecedented initiative undertaken by one of the finest management schools of India – Indus Business Academy, Bangalore. January 1 adhered a long journey of ups and downs before it became as the first day of the year. Today however, January 1 is internationally accepted as the beginning of new year, even then many parts of the world celebrate their separate new year in different times of the year. People waiting for this most awaiting and exciting day to celebrate it, Many people search new and exciting places to spend New Year’s eve. New year’s eve, the last day of the year, is on December 31. In many countries, New year’s eve is celebrated at evening social gatherings, where many people do dance, eat food, drink alcoholic beverages and watch light fireworks to mark the new year. This blog takes a look at the best places in the India where you can spend your New Year’s Day. New Delhi: New Delhi is one of the best place to celebrate the new year party. The many celebrations and all night parties happening in the clubs around the Delhi, make it the one place everyone wants to be on New Year’s Eve. Here you can buy tickets online to celebrate new year eve parties in Delhi. Here are some of them from the list. Electric Night – New Year Celebration with live performance by Bollywood superstar Zarine Khan & DJ Krn Lucky & Falguni Brahmbhatt (live performer and dancer from Mumbai) and a live Sufi band. Bang-Onnn Night 2013 with Hazel Keech, Navraj Hans & DJ Teenu. Mumbai: Mumbai is also a great location to celebrate the New Year party. So many resorts and clubs here feature elaborate parties and banquets to celebrate the new year party event. Buy tickets online here to celebrate new year parties in Mumbai. See some of the most awaiting events. Bangalore: Bangalore is the perfect place for you to enjoy the new year eve, there are lot of happening new year events in Bangalore, you will enjoy Singing, dancing and fireworks to mark the entrance of a new year. Chennai is the another exciting place to bring in the New Year’s ahead in India. A major attraction is the amazing display of fireworks along with music playing, against the backdrop of the Chennai Harbor. Over a million visitors gather here every new year’s eve, trying to get the best spot to view the fireworks on display. Excluding above city Hyderabad, Jaipur and Pune also celebrate New year party with lot of excitement. Popular Sufi singers – Padmashree Ustad Puran Chand Wadali and brother Ustad Pyare Lal Wadali are coming to Delhi to perform live. 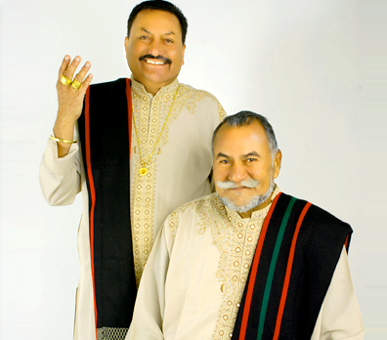 Wadali brothers are well known for their soul touching songs like Tu Maine Ya Na Maine / Duma Dum Mast Qalandar/Yaad Piya Ki/Ik Tu Hi Tu Hi. They generally perform in gurbani, kaafi, ghazal and bhajan styles. Shaam-e-vaishakha Wadali Brothers live concert is going to be a musical evening worth remembering…don’t miss be there on 13th May 12 form 6:00 pm onwards @Siri Fort Auditorium Delhi. Kaifi Aur Main is a celebration of Kaifi Azmi’s poetry and his unparalleled contribution to Indian Cinema. 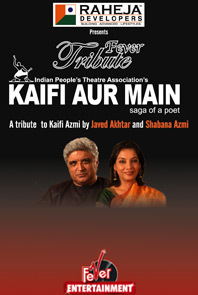 Javed Akhtar and Shabana Azmi Kaifi come together in an exclusive evening to remember the legendary poet and film lyricist Kaifi Azmi through Kaifi Aur Main – a celebration of the renowned Urdu poet’s life with live music. Visit here, to buy Kaifi Aur Main Saga of a poet concert tickets online or to check availability of concert tickets offline. 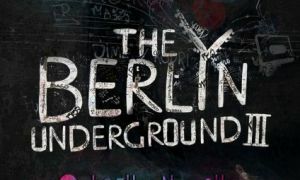 The Concert is on 12 May 2012 from 07:00 PM onwards @Siri Fort Auditorium, Delhi. 6th National Telecom Awards 2012 Date: May 08 to May 11 2012 @Siri Fort Auditoirum, Delhi. 6th National Telecom Awards 2012. CMAI Association of India invites you to join the 6th National Telecom Awards TM 2012, supported by Dainik Bhaskar Group of Newspapers with Star News as Media Partner and 94.3 MY FM as Radio Partners at 430-700PM at Indiabs largest and prestigious Siri Fort Auditorium, New Delhi. This grand event is expected to be attended by over 2500 delegates and is being branded as the mother of all Telecom Events in India. 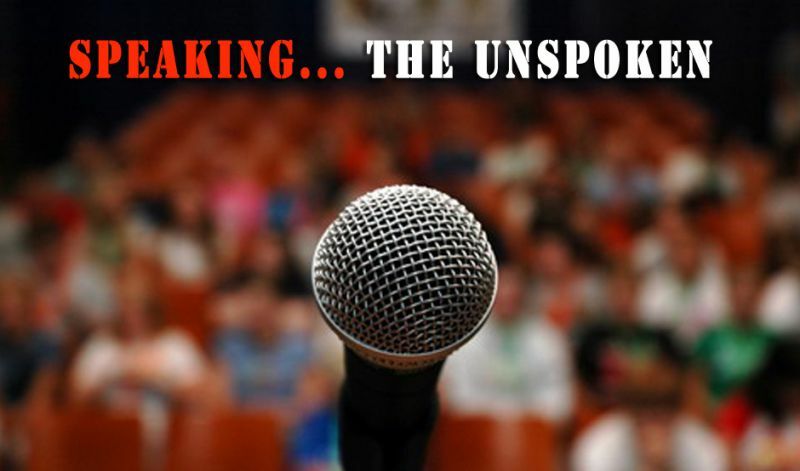 To know more about upcoming events in Delhi, please visit events section on our site Buzzintown.com. This Ramadan, for the first time the famous Hyderabadi Haleem maker “Pista House” has introduced Haleem cooked by women for women. They have cordoned off a section for only women, in all their restaurants in the city (246 branches to be precise!). So now women can enjoy the Haleem ensconced in the women’s special! And incidentally, Hyderabad also boasts of a “Haleem Makers’ Association”. 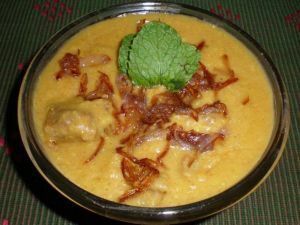 Note: You can read complete article on The incredible ‘Hyderabadi Haleem’ Buzz here. Where to eat in Mumbai during Ramadan? Event Details: The Blue Mug – Play. Devised & Developed by the ensemble. Director- Atul Kumar. Production- The Company Theatre, Mumbai. Performed and Devised By : Rajat Kapoor, Vinay Pathak, Ranvir Shorey, Sheeba Chadha, Konkona Sen Sharma, Munish Bhardawaj. Lights- Meghna Burman/ Atul Kumar. Sound- Preetika Chawla. Costumes- Atul Kumar. Production- Sachin Kamani. The Company Theatre Production. To read more about the blue mug play please click here. Taipei Economic & Cultural Center jointly with Cine Darbaar presents Taiwan Cine Experience – Film Festival from June 27, 2009 to June 28, 2009. June 27, 2009 is the inauguration of Taiwan Cine Experience Film Festival @ the Indian Islamic Cultural Center (IICC), Lodhi Road, New Delhi. As part of Taiwan Cine Experience Film Festival these films will be shown The River, A Borrowed Life, Orz Boys, Threetimes, etc. Hurry! Buzzintown users can win Free Passes to this Film Festival. The adventure begins on 3rd July and will continue till 5th July ’09. This adventure sport event is exclusively for adventurous & fun loving guys who not only like but love biking. You can catch moments of your life. Route for this is from Bangalore to Wayanad to Ooty and then return from there to Bangalore. Hurry! Buzzintown Users can Win Free Entry Passes to go on this Extremely Adventurous Tour Worth Rs. 3500/- (including your food and lodging). Read more on Adventure Sports event i.e. Bulletieer Vol: 2 – Real Men on Real Bikes on our site. If you are searching for good kids events in Bangalore then magic show by Ramesh Magician @ Sir Puttana Shetty Town Hall is your destination. Ace magician K.S. Ramesh; India’s finest with an amazing repertoire of mind-boggling illusions, cabaret-style Magic, close-up Magic, conjuring acts, mentalism and more, all combined to produce the best magical entertainment. A perfect family event. Ramesh has been entertaining audiences across the country in over twenty countries in the last twenty five years on live stage, television, feature films, corporate events, award nights etc. Hurry! Buzzintown users can Win Free Passes to this Magical extravaganza of kids events. 1) $50 Cash prize via paypal. Liew from Make Money Online. 2) 3 free hours of blog consulting, they will analyze your current blog and advise and help you improve your blog to reach your goals worth $100. Adam from The 42nd Estate. 1) Ultimate Blogging Theme worth $67. Carl Ocab from Make Money Online. 2) E-book “Quit Being A Wage Slave Using 10 Easy Steps” worth $47. Peter from Work At Home Blog. 1) $17 Cash prize via paypal. Lee from Make Money Online. 2) 1 Domain, 1GB space, 10GB monthly transfer, 25 email. Stretsh from BloggingNotes. 1) SEO Analysis For MainPage $50. Nicolas Prudhon from SEO Help. 2) Solo ad, it’s an email ad. She will send out your email (ad) to all 30,000+ of her newsletter subscribers worth $50. Kelly from Money Making Mommy. 3) 468×60 banner for 1 month. Simon from Home Based Business. 4) Entrecard 1000 point. Lee from Make Money Online. Live the Music – Music Concert at Planet Jazz, Bangalore from May 22 to May 29 daily at 3 PM. Virgin Mobile and Planet M bring Live the Music, a 24X7 rock fest by over 60 bands for 168 hours.